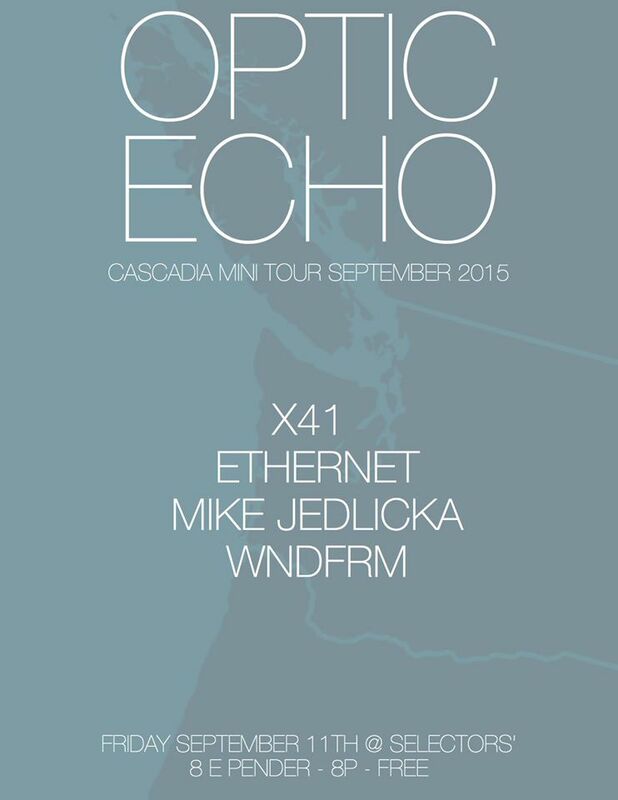 Please join us in welcoming the inaugural stop in the Optic Echo Records mini tour of Cascadia, featuring X41 (Basic Sounds, Vancouver), ETHERNET .:. Tim Gray (Kranky, PDX), _wndfrm (Prologue, PDX), and Mike Jedlicka (Optic Echo, PDX). X41 is a Vancouver-based performing electronic ambient/drone/noise/visual art duo who draw inspiration from both organic and human-made isolationist soundscapes. Subscribing to the Futurist ideology of early ambient music,where the sounds are not complete without the involvement of the surrounding environment, their toolset includes both digital and electro-acoustic instruments, custom projections, lasers, theatrical lighting and costumery. Ethernet is the pulse-ambient project of Portland's Tim Gray, with releases on Kranky, Lifelike Family and many other labels. An MFA graduate of Mills College, Tim wrote his thesis on the use of sound for control, healing and empowerment, and incorporates trance-induction and brainwave entrainment techniques into his productions to create soundscapes conducive to meditation and healing work. Techno's pounding kick is slowed, muted and recontextualized as a hypnotic pulse, underlining constantly-shifting synthesizer textures and environmental field recordings. Dream-like, perhaps mystical, sounds that one might experience while wandering in the deep woods. Mike is the owner of Optic Echo and hosts the radio show Optic Echo Presents live on XRAY.FM Sunday nights 5-7pm PST. Mike's live music currently involves live looping processed synths, guitar, and vocals which build into a mix of ambient and experimental atmospheres.